Five hundred generations ago, glaciers a mile high surrendered to a landscape of crystal lakes, jagged gorges and thundering waterfalls. Today the view is green with vineyards and farms. It’s lush with gentle hills and wild forest. It’s lively with villages and energized by people who love the sights, sounds and flavors of a region still unspoiled. Ithaca is in the heart of the Fingerlakes Region in central New York State, four hours from New York City, three hours from Niagara Falls, two hours from Rochester and four hours from Philadelphia. 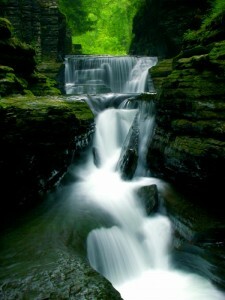 Ithaca is famous for its many waterfalls, more than 100 within 10 miles of downtown. If you put them all together, it’s a waterfall 7,342 feet tall. That’s 1.39 miles of falling water. Famous Ithacans include: “Roots” author Alex Haley, astronomer Carl Sagan, television writer Rod Serling, and former World Bank president Paul Wolfowitz. Direct flights to Ithaca depart from Newark, LaGuardia, Detroit, and Philadelphia airports, all of which offer transportation from major cities around the world. Flights into Ithaca are limited, so we highly recommend booking your air travel as soon as possible. If you cannot get a flight to Ithaca, you can fly to Binghamton, Elmira, or Syracuse and drive to Ithaca from there. Bus Service is also available. Once in Ithaca, you can get around town using T-CAT, our local bus service. Taxi service from the airport and other locations is available by calling Ithaca Dispatch at 607-277-7777. During the conference, free coach transportation will be available between the Cornell campus and most of our conference hotels.